With two cooks in the house, sometimes my mental inventory of stores doesn’t tie in with what is (or, more often, is not) in the cupboard. I’ll often be half-way through baking a cake and I’ll reach for the eggs only to find that my beloved must have made a giant omelette for breakfast because the dozen or so that were there yesterday have vanished. Today, I had a hankering for brown soda bread to go with my friend Penny’s incredible Peach Jam. There were a few obstacles in my way, namely no brown flour, and no oatmeal – the two main constituents of my brown soda bread recipe. I could have sworn there was some there last time I looked... hmmmmm. This white soda bread was a total experiment. I added the seeds to make it seem half-healthy. Soda bread is normally cooked on a baking sheet. This is quite a wet mixture so I’ve used a 2LB loaf tin. 1 Rub a 2LB loaf tin with the olive/sunflower oil. 2 Place the flour, bicarbonate of soda, salt and seeds in a mixing bowl, keeping back about a tablespoon of the mixed seeds. Add the buttermilk, stirring just until no dry flour remains. 3 Transfer to the prepared baking tin and level the surface before scattering with the tablespoon of seeds you reserved. Place in the pre-heated oven and set your timer for 10 minutes. After 10 minutes has elapsed, lower the heat to 180°C and continue baking for a further 15 minutes. 4 Take the loaf from the oven and remove the tin. A cooked loaf will sound hollow when tapped on the base. We have similar problems in our house with 'mis use' of intended ingredients. We always make brown soda bread, but last week whilst on a mini-break in Mayo we found a place in Enniscrone that made a lovely light and delicious white soda bread. So now, seeing yours, I think it is a sign. White soda bread must appear on the menu. Lovely photos Hester. Great light! I just saw another post about missing ingredients. That person did not go to the store until another day. Kudos to you going ahead and making due with what you had. Your bread does look delicious-even with white flour! @ WiseMona - Thanks Mona, did you get to the Edwardian seaweed baths in Enniscrone? It is the quaintest place. They had a lovely little cafe there last time I visited. Hey I have some peach jam that needs a vehicle for eating! Looks like I could whip up this bread in no time! I am always the one doing grocery so there is no one to blame when things are running out. Because I hate not to have the things I need I always buy things double or even triple when I know I use it a lot. I love your bread. I bet it tastes good with any homemade jam. I totally feel you on the shopping issues! I've taught myself now to always check that I have everything or at least decent substitutes before I start the baking! 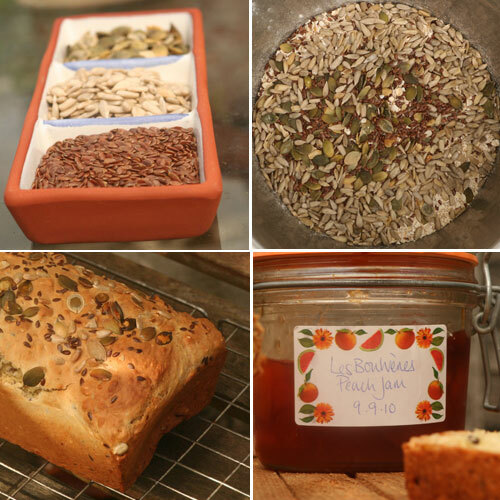 This bread looks really tasty and I love the use of pumpkin and sunflower seeds! I am the lucky sole cook in my kitchen. But sometimes I forget that I used the last of a staple ingredient for a recipe the day before. No one to blame but myself. I think you did a fabulous job in substituting ingredients though. This looks fabulous! When I buy bread (I usually make it) hubby's one requirement is that it has "seeds". He'd adore this one! Proper Irish bread, I love it. I don't do enough bread making so I'll have to give it a try. What I hate most is when people put things back in the fridge/cupboard with only the tiniest amount left so that you think that you still have some but when you go to use it, there's not enough for anything - Grr! The bread looks great and I love the fact that you made do. I find myself having to do that more and more these days! The bread looks sooo good! I'm lucky in that I'm the only one who does any of the cooking, so if I run out of something, it's my own fault! Unless it's leftover meat I'm saving for something...then I know my husband's to blame. BWA HA! I hope you weren't in too much trouble when hubby realized what was missing :) Believe me, its a good problem to have. I NEVER have that problem. CK does like to hide my cooking utensils though when he's on dish duty. 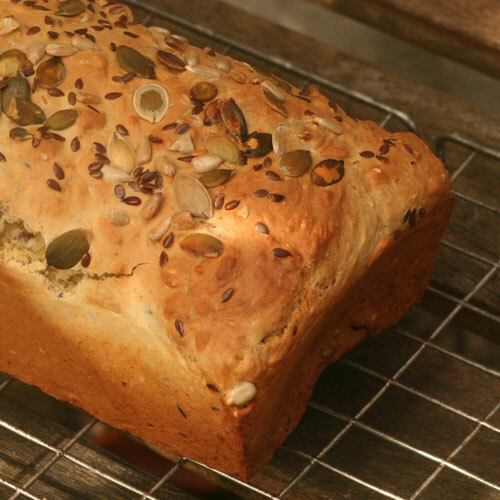 Love the look of your soda bread with seeds (was about to call it seedy but then that really didn't work, did it?) Love when you get in a jam, though. Hopefully hubby didn't mind too much with ingreds missing: I'm like ParsleySage - sometimes I wish it would be a problem in our house, boohoo! I love soda bread...my mom used to make this for me all the time. So delicious! Your kitchen predicament I have all the time! I live at home right now with a teen brother (who can eat FOREVER) and something that was in the fridge or cupboard an hour ago can definitely be gone. There are a lot of mid-baking/cooking trips to the quick stop and grocery store around here. Love it! We have the same issues at our house. Two cooks definitely adds an extra challenge. I think it look excellent even if it wasn't what you originally planned! I do most of the cooking, but my husband is always making eggs for breakfast and using the ones I already had plans for! :) Love what you made with what you had on hand. I think the seeds definitely make it healthier! I love your spirit... make due with what you have! And then look at what you came up with! I think this bread is great! I would love some with that jam! 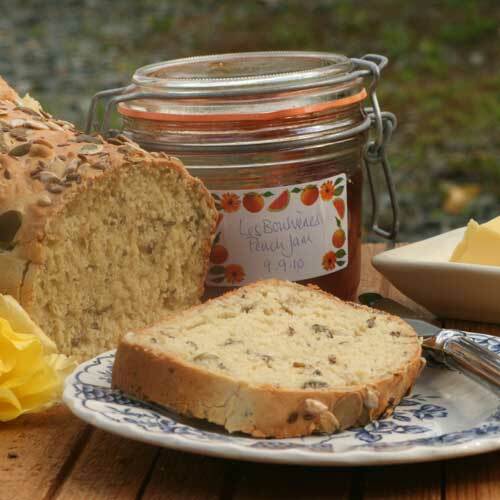 That happens to me all of the time too, especially eggs :) Gorgeous soda bread...love all of the seeds! I've never made soda bread before but just saw it being made on a food show, and now read your post. It looks delicious - will have to try it out. Thanks! Haha so what happened to the chicken curry?! Did he have enough yogurt and cardamom? LOL! Your soda bread looks beautiful!! Perfect to go with your friend's peach jam! I'd be eating non stop! I love soda breads...especially in the fall with a nice warm soup. A Classic Wedding Cake – Oh Crumbs!